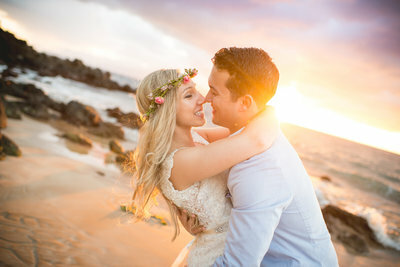 After meeting at the gym a little over two years ago, Rachel and Matt chose to get married at a beautiful Maui Wedding Venue highlighting the lush greenery of the island. Check out that view! It’s hard to imagine a more stunning location to get married. To embrace the Aloha vibe, even more, all of their wedding guests were dressed in festive Hawaiian inspired attire. This idea turned out so cute and was executed in a really fun and classy way, we love it! This bride and groom not only were incredibly sweet together, but they also looked fantastic. Rachel was absolutely stunning in a BHLDN dress with such beautiful detailing, we are obsessed with her entire look! We also cannot get over this elegant updo Salon 253 gave our bride, so gorg! Finished off with a few flowers to match her Custom Bouquet and she was wedding ready 🙂 . Matt looked like a movie star he was so dashing in his three-piece gray suit and blue tie! We love how Rachel’s bouquet was wrapped with a navy ribbon to match the blue stone in her wedding ring! 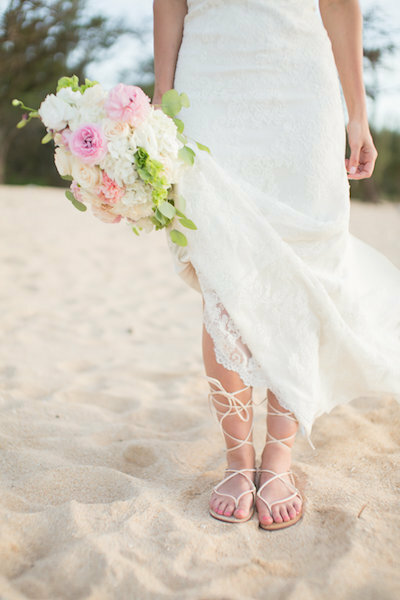 These blue accents tied everything together perfectly at their Maui Wedding Venue. 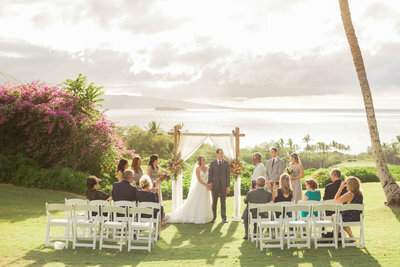 Thank you, Rachel and Matt, for including Simple Maui Wedding on this very special occasion. Congratulations and Warm Aloha!